Hello out there boys and girls, and happy International No Diet Day or INDD. Today is a day when I celebrate and honor the decision I made many years ago to stop letting a number on a scale dictate the confines of my life. It’s a day to celebrate the decision I made to celebrate my body, every bump and curve of it, as is. It’s a day to celebrate the decision I made to stop putting my life on hold until after I reached an arbitrary body size number–be in the number on the scale or the number on the tag in my dress. Now it’s easy for outsiders looking in, who may understand nothing about my struggle to suppose that I’m celebrating the day I decided to give up on myself–the day that I decided to give up on being healthy–the day I decided to be fat. But this could not be further from the truth. I did NOT give up on myself, I made the choice to save myself. I decided to stop “weighting around” to achieve and maintain a body that fit into some arbitrary description of social acceptability and start LIVING my best life in the body I had right at that very moment. And I decided that counting calories and calculating points was not an effective success strategy, but rather a recipe for frustration and stagnation. So lest you are confused about what INDD means to me, I’d like to offer this quick reference guide. Happy eat spaghetti for breakfast if that is what your body is hungry for day. Happy I’ll stop eating cookies because I am full right now and can have more tomorrow day. Happy I’ll eat vegetables because my body craves them and they are delicious day. Happy, I’m no longer obsessed with calculating the number of calories burned while dialing the phone day. Happy, what’s on my plate or in my grocery cart is none of your darn business day. Happy I don’t have to take of my earrings for my weekly public weigh-in day. Happy, I am inspired by and enjoy beautiful, delicious and wonderful food day. As you might have guessed, I am a BIG fan of INDD. And I hope you are too! Let’s start by taking just a single day to honor our bodies and enjoy every bite that life has to offer. I did that about 15 years ago and it was one of the best decisions I ever made. So my dear reader, happy your body is awesome just the way it is day. I sincerely hope it brings you nothing but joy! P.S. If you’re enjoying the blog, why not sign up for the Fat Chick Clique. Get access to cool free stuff, like the new resistance workout I launched this week at the American Diabetes Association Active Living Booth. Enjoy! And don’t forget to live every moment to the fullest. 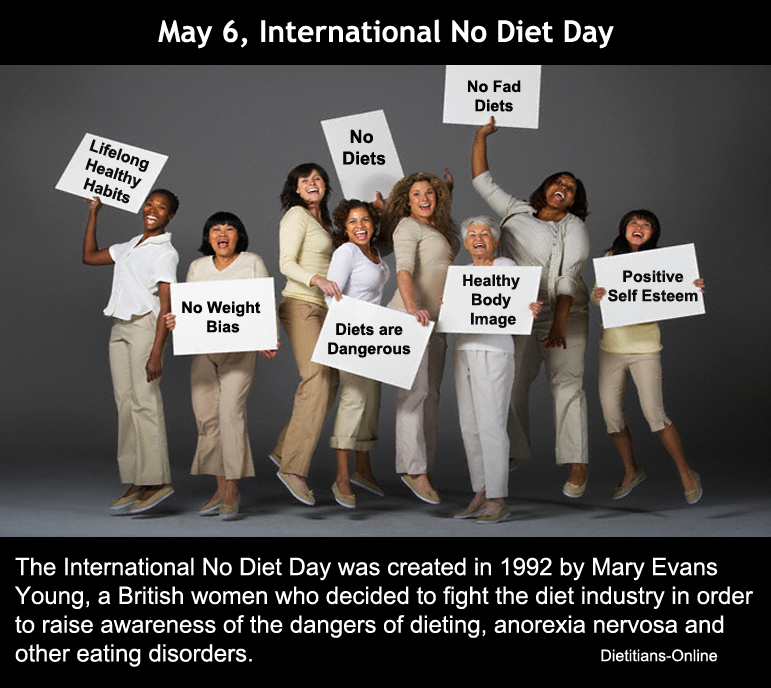 : body for life, body love, enjoy life, INDD, International No Diet Day, Intuitive Eating, living your best life, stop "weighting around"
Body Hatred–We have an “App” for That! What a truly beautiful post that gives folks glimpses into what a weight-neutral, non-effed-up-around-food world that lies within our grasp. And I want Fat Chick Clique in my life! Me want! How do I go about signing up for this magical thing?